The summer shed season brings out a wide variety of acts, which this year includes Boston’s Heaven on Earth Tour. “Over the years, Boston’s designs have included a lot of the latest technology that was available at the time,” notes Mark Fetto, chief operating officer of Morpheus Lights, the tour’s lighting vendor. This year, Boston is mixing its old hits with new material, a balance that is reflected in the lighting rig. 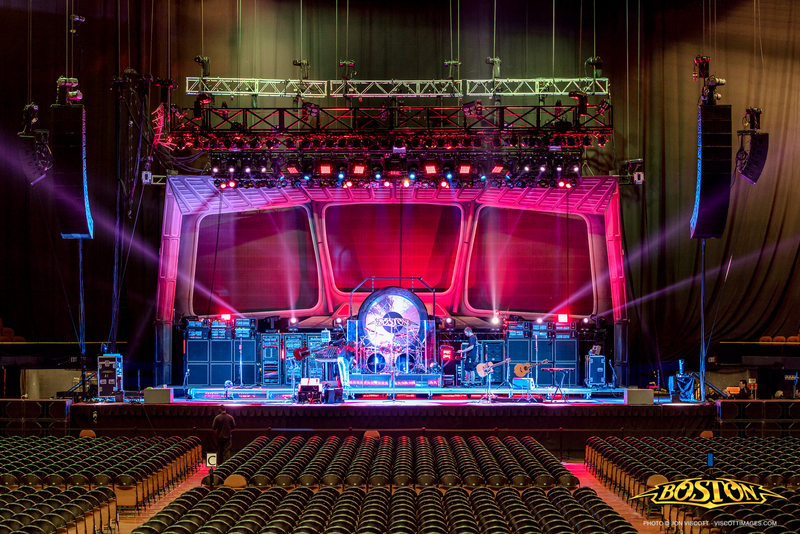 “The rig is half old-school—that’s why I kept the PAR cans—and half new, with the hip moving light stuff,” explains the band’s longtime lighting designer, Gregg Maltby. 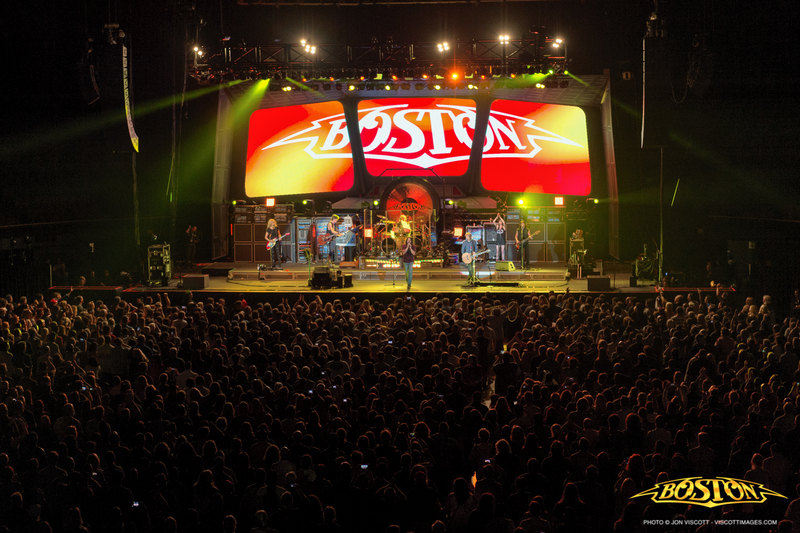 Boston is announcing the 2015 Tour Dates Today. This list will be updated regularly. Visit the Tour Page for all of the Dates and Venues. Just got home from our amazing 68-show 2014 BOSTON summer tour. The trip opened with a sold out performance at the beautiful Hard Rock Live in Hollywood, Florida, and ended four months later with two sold out shows at Tokyo's iconic Budokan in Japan. This was simply the most amazing BOSTON tour I have ever experienced - the best live performances by the band in our history, the best sound, amazing lights from our LD Gregg Maltby, exciting venues, wide screen panoramic videos, and of course most important of all, the best and most enthusiastic fans ever! Behind the scenes the musicians and crew members worked very hard to pull off the performances and fine-tune the sound every night, but once on stage, we had as much fun at the shows as the audience did. The players and technicians with BOSTON made the show look effortless, but trust me, it's a lot harder than they made it look! As I took the stage for the last show in Tokyo with Gary, Tommy, Tracy, Kimberley and Jeff, I realized how lucky I was to be surrounded by people who are both friends and such excellent players, performing with all this equipment so expertly assembled and operated night after night. As icing on the cake, near the end of the night Siobhan Magnus [American Idol season 9 finalist] took the stage and nailed the lead vocal for "Walk On." Even after a difficult day traveling and scrambling to get ready for a show, stepping onto the stage with these exceptional performers to play for the best fans in the world was an incredible rush - the day's problems were instantly erased and life was very good! concerts in the USA, Canada and Japan with sun, rain, wind, friends, relatives, a bunch of terrific bands and memories we'll never forget! Like the show in Bangor where Tom had his guitar done up with a checkerboard motif as an homage to Rick Nielsen of Cheap Trick. Or the thunderstorm in Cleveland when the power went out for a couple of seconds but the band played on. Or the show where there were so many bugs in the air that I may have swallowed one while singing and thereby lost my vegetarian status for the day. I think we all had former high school bandmates come to one show or another and make us laugh and remember the crazy gigs we did in the past. We got to see aunts and uncles and cousins we hadn't seen in years. And some that weren't even born the last time we came through town. What a terrific crew we've had working with us! 24 guys and 5 women that became our immediate family for five months. They put in long days, every day, to get the audio, lights and video set up and working perfectly whether it was in the L.A. Forum or the infield at the South Dakota State Fair. We were very fortunate to have been able to share our stage with some terrific bands this year. Cheap Trick, The Doobie Brothers, Blue Oyster Cult, Night Ranger, Mickey Thomas' Starship, Kory and the Fireflies, .38 Special, Kansas, Reb Beach Project, Don Felder, Sweet, April Wine, Joshua Scott Thomas, Scott Bratcher, Random Manor. One sad note was when we heard about Jimi Jameson passing away just a few weeks after we shared the stage with his band, Survivor. Our four final shows in Japan were a wonderfully unique experience. The audiences were so attentive and supportive. But whether in Japan, Canada, or the US, what we'll remember most are the fans who sang along so loudly, we could barely hear our guitars! Thanks for making our summer so special for just another band out of Boston.